Burcham Elem. 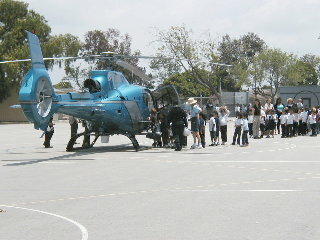 School Gets "End of the School Yr" Treat: Visit from LBPD Helicopter "Fox"
(June 12, 2003) -- Students at ELB's Burcham Elementary School got a memorable "end of the school year" treat: a full school assembly visit from LBPD's crime fighting helicopter: "Fox." 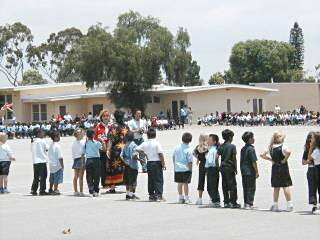 Burcham's student body was already assembled outside when LBPD's big blue bird arrived. Students followed teachers' directions (LBReport.com comment: very well behaved! Kudos to Principal Pamela Avera) and excitedly lined up for a look at the aircraft and its high tech crime fighting gizmos. They also met the police officers who catch bad guys on the ground using LBPD's eye in the sky...and the pilot was LBPD Corporal Al Wilson, the uncle of one of Burcham's students. 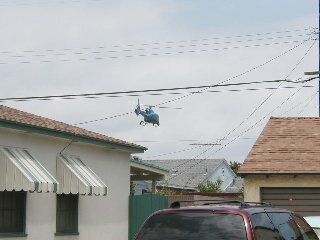 By about 1:00 p.m., LBPD's helicopter departed over ELB's South of Conant neighborhood...a nice memory for Burcham's students to carry through summer and beyond.